BSSC Inter Level Exam Cancelled after Paper Leak: So, BSSC Scam was true as Bihar declared its Inter Level exam cancel which was held on 29-01-2016 & 05-02-2016. A good news for candidates who has recently appeared for Bihar SSC Inter Level exam. Bihar Staff Selection Commission (BSSC) organized written test for Inter Level exam on 29th January, 5th, 19 and 26th February 2017. News was spread across the candidates that Bihar SSC will be cancelling the Inter Level Examination due to leakage of question paper at various exam centers which turned out to be true. Bihar civil Court Typist Online Exam cancelled. Check notice..!! Apart from Exam conducted on 29th January & 5th February, Bihar Government has cancelled upcoming exam on 19 & 26 February 2017. As per the notification published by Bihar Government, BSSC Inter Level Exam paper was leaked and now re-examination will be conducted very soon. It is being said that many candidates got the actual exam questions earlier than beginning of BSSC Inter Level written exam. Many candidates were caught having a page with answer keys written on it. 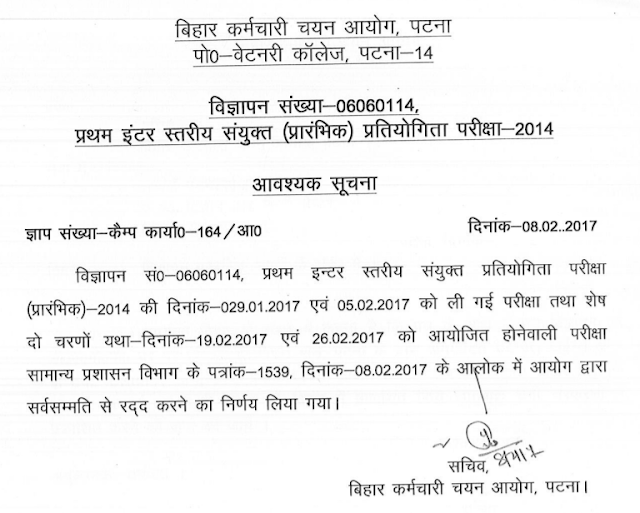 Check out the Cancellation notice of BSSC Inter Level examination for the various Clerk level post in Bihar Government. Due to Question Paper Leak of BSSC Inter Level examination dated 29-01-2017 & 05-02-2017 for the post of Panchayat Sachiv, Clerk, LDC, DEO and various posts cancelled. Next Date would be announced later on. Now confirmation have been made by the Bihar Staff Selection Commission (BSSC) and investigation is ended up. They got the rumour right that BSSC Inter Level exam questions paper was leaked much earlier than written examination. This leads to Inter Level exam cancellation in Bihar. So these are the reasons that resulted in re-examination of BSSC Inter Level Exam which was held on 29-01-2016 and 05-02-2016.